Eileen Myles’ poetry actively, consciously pursues the tangential thought. 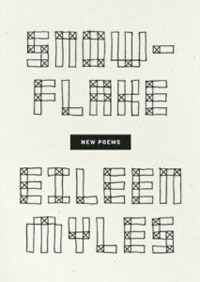 In her new dual collection of poems, Snowflake and Different Streets, the text glides into the tangent like she has no sense of return, like she’s just floating. Reading “the L.A./Driving poems” is not unlike the experience of seeing her perform—her eyes incredibly committed to the page and her free hand up in the air, making quick wrist turns along with line breaks. She isn’t speaking to anyone in particular but it is a conversation to be sure. It is her incredibly precise voice that activates her work. She doesn’t invest in language as representation, she isn’t trying to convey meaning so much as she just wants to cut straight to the stuff of being. At times, her poetry is so slim I lose my breath a little. The second Snowflake poem reads much more like photograph, arresting and lacking a desire for explanation. It’s a moment, it’s a slice and there is pleasure in that too. I don’t have much hesitation about this being my favorite collection of Eileen Myles’ work. There’s a low mumble of sweetness threading the collection—an eagerness to see the secret radiance in everyday things. It feels youthful and tenuous and it makes me a little nervous. The work is in constant negotiation between Myles’ spontaneous delight and the threat of that delight burning off. It is that fragile optimism that makes her work so heartbreaking at times. There is so much space for the general state of awe to break, for the tangent to lead into a blank space but even when the work dips quite low it seems more like she is drawing a curtain rather than making some irrevocable descent. As for cynicism, which is so beautifully absent from this collection–I imagine Myles holding out a hand, pushing it off the page. Saehee Cho holds an MFA in Writing from The California Institute of The Arts. Her work has been featured in Sidebrow, decomP, BAP, PANK and Ex Nihilo. She lives in Los Angeles.